Rosevelt Noble, BS’97, PhD’03, assistant dean of students and director of the Bishop Joseph Johnson Black Cultural Center, is the recipient of the 2018 Vanderbilt Alumni Education Award. The Vanderbilt Alumni Association Board recognized Noble as a popular speaker for the Commodore Classroom program that brings university faculty to alumni and friends in chapter cities. Noble has made several presentations of the lecture “Lost in the Ivy,” an oral history project documenting the history and significance of African Americans on campus from 1953 to present. 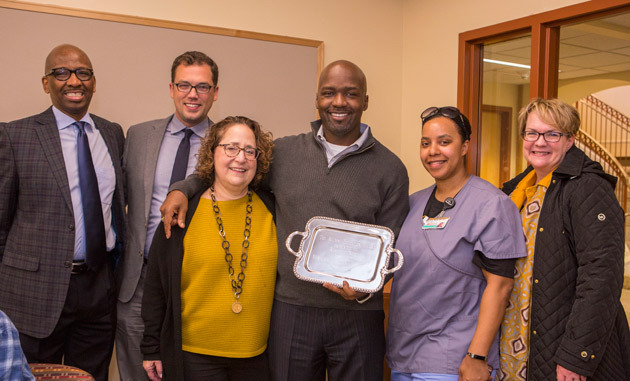 Board member Kyle Southern, BA’07, MPP’09, presented the award to Noble April 19 during a surprise visit to his Sociology 3624: Prison Life class. Vanessa Beasley, dean of The Martha Rivers Ingram Commons, Frank Dobson, associate dean of students, and Noble’s wife, Dr. Kristen Noble, BA’03, were also in attendance. Noble is also a senior lecturer of the Department of Sociology and a faculty head of house on The Ingram Commons. Through the years he has been involved in a number of initiatives at the university, including service on the executive board for the Association of Vanderbilt Black Alumni, as a member of the Chancellor’s Diversity Discussion Group and the Black Cultural Center’s advisory board, and on the Student Conduct Review Board. He is faculty adviser to the student group Revitalizing and Empowering Vanderbilt’s African American Male Population (REVAMP) and has served as mentor for the Posse program at Vanderbilt. The Vanderbilt Alumni Association Board has chosen a faculty member for the Alumni Education Award each year since 1982. The honor includes a cash prize and a silver tray.